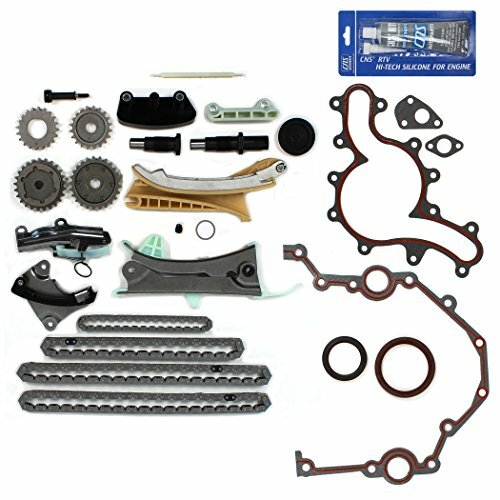 Product Description 100% Brand New Items, Never Used Or Installed Professional Installation is Highly Recommended No Instruction Included Package includes: 2X Timing Chains (122 Links/C-391) 2X Camshaft Phaser Sprockets 2X Cam Phaser Sprocket Mounting Bolts 1X Tensioner (Left Upper) 1X Tensioner (Right Upper) 1X Guide (Tensioner Rail-Left) 1X Guide (Tensioner Rail-Right) 1X Guide (Fixed Rail-Left) 1X Guide (Fixed Rail-Right) 1X Crank Gear (Double Row-One Side Recessed Only) 2X Camshaft Spacers 2X Vct Variable Camshaft Timing Solenoid Oil Control Valve (Left & Right) 2X Screws 2X Oil Control Valve Seals 1X Timing Cover Seal Set 1X Oil Pump 1X Water Pump Timing Cover Gaskets Valve Cover Gaskets Just As Pictures Show Fitment: 04 - 08 Ford / Lincoln 5.4L Sohc V8 (24-Valve), 3-Valve Engine Only, Triton 05 - 11 Ford Expedition 5.4L 330Cu. In. V8 Sohc (24-Valve) 04 - 09 Ford F-150 5.4L 330Cu. In. V8 Sohc (24-Valve) 05 - 10 Ford F-250 Super Duty 5.4L 330Cu. In. V8 Sohc (24-Valve) 05 - 09 Ford F-350 Super Duty 5.4L 330Cu. In. V8 Sohc (24-Valve) 07 - 07 Lincoln Mark Lt 5.4L 330Cu. In. V8 Sohc (24-Valve) 05 - 10 Lincoln Navigator 5.4L 330Cu. In. V8 Sohc (24-Valve) Will Fit 5.4L V8 3-Valve Engine Only. 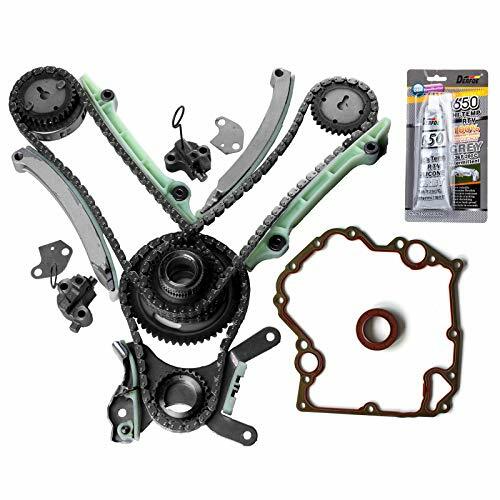 Package Includes : 2 Timing Chain (jack shaft to cams 78 links) 1 Rear Jack Shaft Chain (crank to jack shaft 62 links) 1 Rear Cam Chain Tensioner 1 Front Cam Chain Tensioner 1 Jack Shaft Tensioner 1 Rear Cam Sprocket Right (25 teeth .461" hole) 1 Front Cam Sprocker Left (25 teeth .572" hole) 1 Front Jack Shaft Sprocket (20 teeth 1.102" hole) 1 Rear Jack Shaft Sprocket (20 teeth 1.102" hole) 1 Front Cam Chain Guide Rail 1 Rear Cam Chain Guide Rail 1 Jack Shaft Fixed Guide Rail 1 Balance Shaft Chain (62 links) 1 Balance Shaft Tensioner 1 Balance Shaft Fixed Guide Rail 1 Oil Line Restrictor 1 Timing Cover Gasket 1 Water Pump Mounting Gasket 1 Crankshaft Front Oil Seal 1 Crankshaft Rear Main Seal 2 Oil pump inlet tube Gaskets 1 RTV Hi-Temp Gasket Silicone Sealant Product Fitment For : 97 - 10 FORD EXPLORER 4.0L SOHC V6 12V, VIN CODE "E, K" 01 - 10 FORD EXPLORER SPORT TRAC 4.0L SOHC V6 12V, VIN CODE "E, K" 05 - 10 FORD MUSTANG 4.0L SOHC V6 12V, VIN CODE "N" 01 - 11 FORD RANGER 4.0L SOHC V6 12V, VIN CODE "E, K" 01 - 10 MAZDA B4000 4.0L SOHC V6 12V, VIN CODE "E, K" 98 - 10 MERCURY MOUNTAINEER 4.0L SOHC V6 12V, VIN CODE "E"
**Remark: This kit has water pump with oulet pipe which WILL NOT fits for 2WD, Automatic Transmission, with Column Shift models. 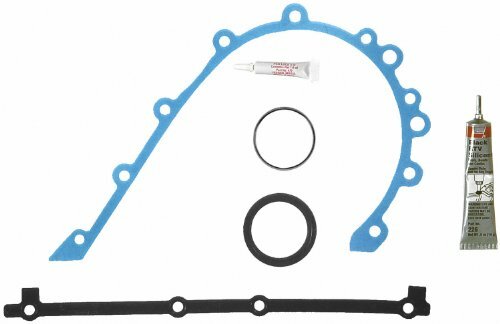 If you need the water pump without oulet pipe, please check our store. We have it listed in separate listings. 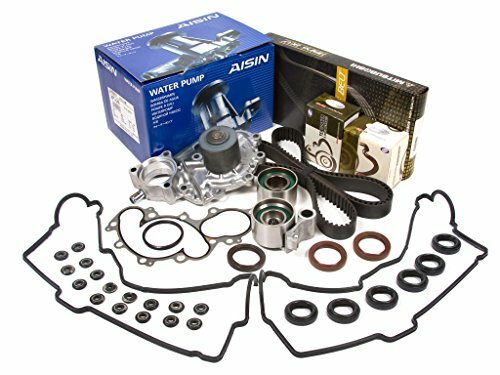 This item includes: 1 Mitsuboshi Timing Belt (191 teeth) (Mitsuboshi - OEM Supplier for HONDA / SUBARU) 1 GMB Roller Tensioner Bearing (bearing assembly) 1 GMB Idler Bearing 2 Camshaft Seals (38 x 50 x 10.5) 1 Front Crankshaft Seal (40 x 55 x 6) 1 Hydraulic Tensioner / Tensioner Adjuster - is not included 1 AISIN Water Pump (with outlet pipe) (AISIN - OE Supplier for TOYOTA / LEXUS) 2 Valve Cover Gaskets 6 Spark Plug Tube Seals 16 GrommetsPart Numbers: TBK271(M)-GMB, WPT-100, VC2034, 2 = 38 x 50 x 10.5, 1 = 40 x 55 x 6Product Fitments: 1996-2002 TOYOTA 4RUNNER 3.4L 3378CC V6 DOHC, (24 VALVE), ENG. 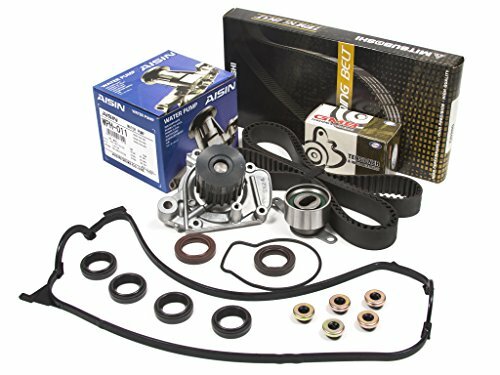 CODE "5VZFE" 1995-1998 TOYOTA T100 3.4L 3378CC V6 DOHC, (24 VALVE), ENG. CODE "5VZFE" 1995-2004 TOYOTA TACOMA 3.4L 3378CC V6 DOHC, (24 VALVE), ENG. CODE "5VZFE" 2000-2004 TOYOTA TUNDRA 3.4L 3378CC V6 DOHC, (24 VALVE), ENG. 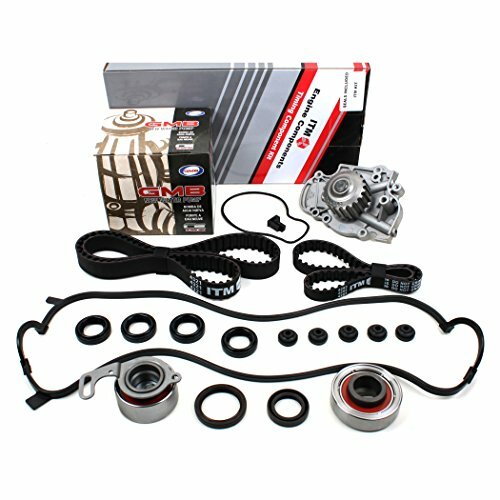 CODE "5VZFE"
This item includes: 1 Mitsuboshi Timing Belt (104 teeth) (Mitsuboshi - OE Supplier for HONDA / SUBARU) 1 GMB Roller Tensioner Bearing ( bearing assembly) 1 Camshaft Seal (29 x 45 x 8) 1 Front Crankshaft Seal (31 x 46 x 8) 1 AISIN Water Pump with Gasket (AISIN - OE Supplier for TOYOTA / LEXUS) 1 Valve Cover Gasket 5 Grommets 4 Spark Plug Tube SealsPart Numbers: TBK224(M)-GMB, WPH-011, VC4029, 1 = 29 x 45 x 8, 1 = 31 x 46 x 8Product Fitments: 1996-1997 HONDA CIVIC DEL SOL S 1.6L 1590CC 97CID L4 SOHC, (16 VALVE), ENG. 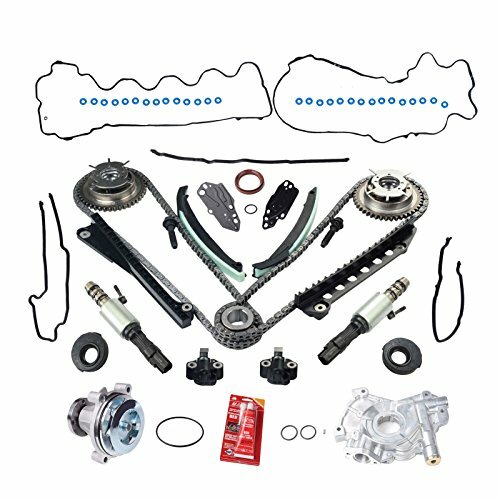 CODE "D16Y7" 1996-1997 HONDA CIVIC DEL SOL Si 1.6L 1590CC 97CID L4 SOHC, (16 VALVE), ENG. CODE "D16Y8" 1998-2000 HONDA CIVIC GX 1.6L 1590CC 97CID L4 CNG SOHC, (16 VALVE), ENG. 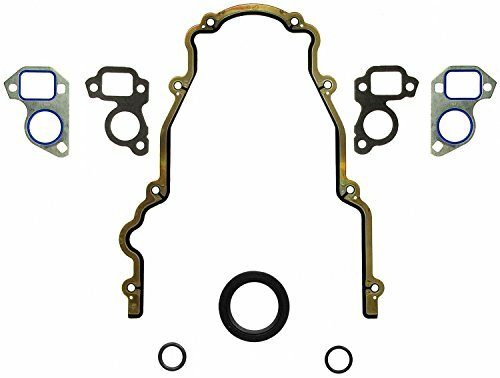 CODE "D16B5" 1996-2000 HONDA CIVIC CX, DX, LX 1.6L 1590CC 97CID L4 SOHC, (16 VALVE), ENG. 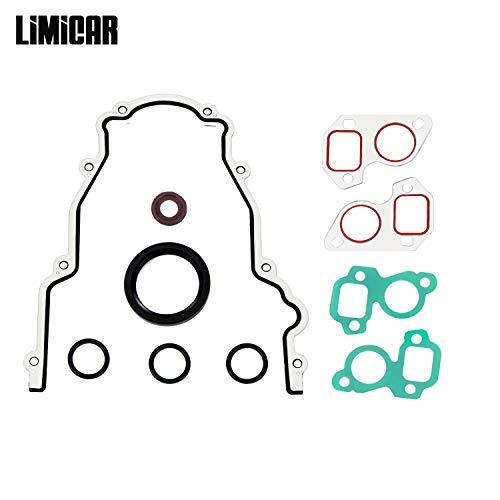 CODE "D16Y7" 1996-2000 HONDA CIVIC EX 1.6L 1590CC 97CID L4 SOHC, (16 VALVE), ENG. 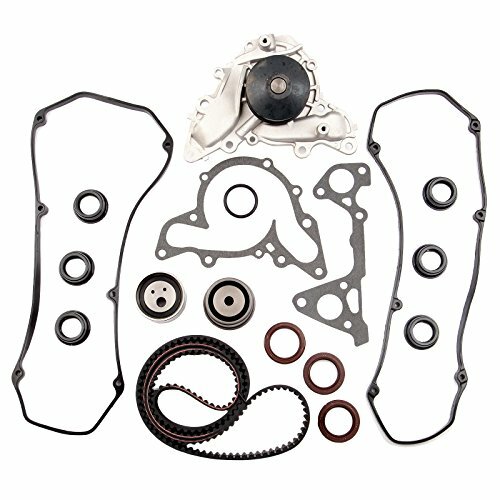 CODE "D16Y8" 1996-2000 HONDA CIVIC HX 1.6L 1590CC L4 SOHC, (16 VALVE), ENG. 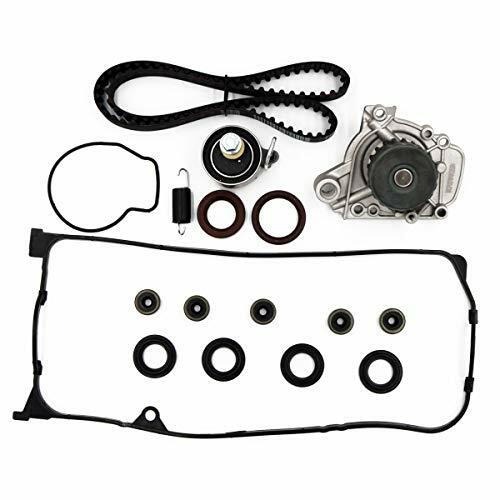 CODE "D16Y5"
**Remark: This kit has water pump with oulet pipe which WILL NOT fits for 2WD, Automatic Transmission, with Column Shift models. If you need the water pump without oulet pipe, please check our store. We have it listed in separate listings. 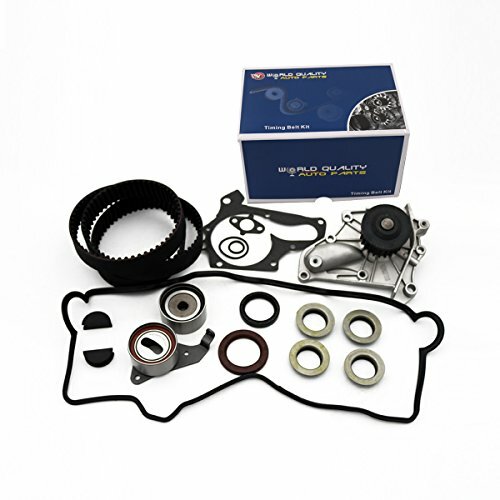 This item includes: 1 Mitsuboshi Timing Belt (191 teeth) (Mitsuboshi - OEM Supplier for HONDA / SUBARU) 1 GMB Roller Tensioner Bearing (bearing assembly) 1 GMB Idler Bearing 2 Camshaft Seals (38 x 50 x 10.5) 1 Front Crankshaft Seal (40 x 55 x 6) 1 Hydraulic Tensioner / Tensioner Adjuster 1 Thermostat 1 AISIN Water Pump (with outlet pipe) (AISIN - OE Supplier for TOYOTA / LEXUS) 2 Valve Cover Gaskets 6 Spark Plug Tube Seals 16 GrommetsPart Numbers: TBK271(M)-GMB, WPT-100, VC2034, T62021, CT2034, 2 = 38 x 50 x 10.5, 1 = 40 x 55 x 6Product Fitments: 1996-2002 TOYOTA 4RUNNER 3.4L 3378CC V6 DOHC, (24 VALVE), ENG. CODE "5VZFE" 1995-1998 TOYOTA T100 3.4L 3378CC V6 DOHC, (24 VALVE), ENG. 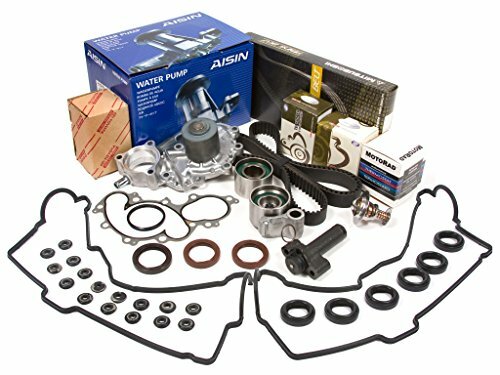 CODE "5VZFE" 1995-2004 TOYOTA TACOMA 3.4L 3378CC V6 DOHC, (24 VALVE), ENG. CODE "5VZFE" 2000-2004 TOYOTA TUNDRA 3.4L 3378CC V6 DOHC, (24 VALVE), ENG. 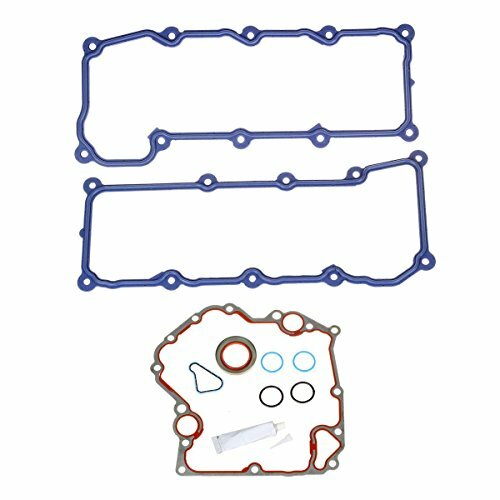 CODE "5VZFE"
High Quality Timing Cover+Valve Cover Gasket fits: 2004-2005 DODGE DAKOTA 3.7L 226CID V6 SOHC, (12 VALVE), VIN CODE "K" 2004-2005 DODGE DURANGO 3.7L 226CID V6 SOHC, (12 VALVE), VIN CODE "K" 2005 DODGE RAM 1500 3.7L 226CID V6 SOHC, (12 VALVE), VIN CODE "K" 2005 JEEP GRAND CHEROKEE 3.7L 226CID V6 SOHC, (12 VALVE), VIN CODE "K" 2002-2005 JEEP LIBERTY 3.7L 226CID V6 SOHC, (12 VALVE), VIN CODE "K" Cross Reference Part Number: VC8-30300 Package Includes: 2 Valve cover gaskets Timing Cover Gasket Interchange #: TCS46000, TCS46022 Part Numbers: TCS30400, SL1000 Remark: 2004 and up models use silicone sealant to seal timing cover. 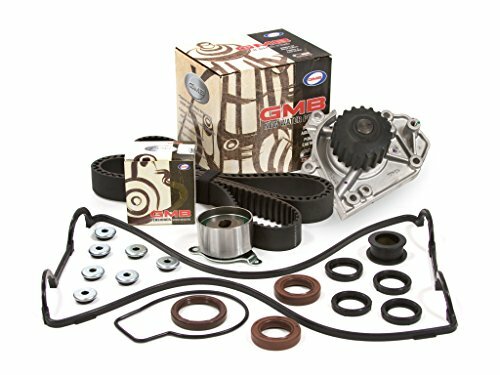 This Item Includes: 1 Timing Belt (125 teeth) 1 GMB Tensioner Roller (bearing assembly) 2 Camshaft Seals (27 x 43 x 9) 1 Front Crankshaft Seal (38.5 x 50 x 7.5) Tensioner Spring - is not included 1 GMB Water Pump with Gasket 1 Valve Cover Gasket 7 Grommets 4 Spark Plug Tube Seals Parts Number: TBK184-GMB, WP135-1400, VC4011, 2 = 27 x 43 x 9, 1 = 38.5 x 50 x 7.5 Part Fitments: 1996-1998 ACURA INTEGRA RS Non-VTEC 1.8L 1834CC L4 DOHC, (16 VALVE), ENG. 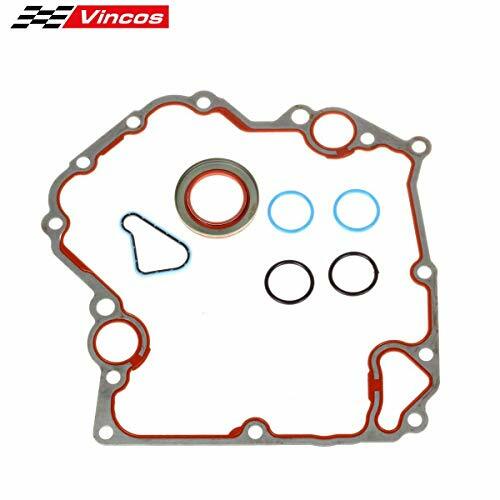 CODE "B18B1" 1997-2001 ACURA INTERGA GS Non-VTEC 1.8L 1834CC L4 DOHC, (16 VALVE), ENG. 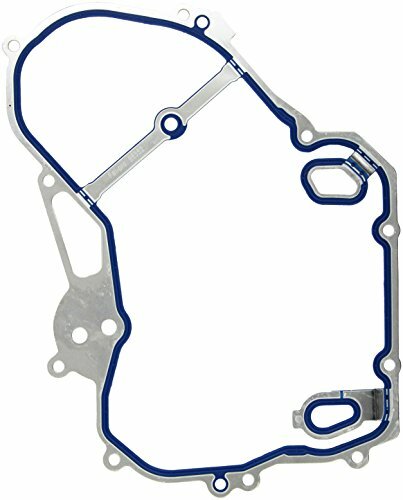 CODE "B18B1" 1996-2001 ACURA INTEGRA LS Non-VTEC 1.8L 1834CC L4 DOHC, (16 VALVE), ENG. 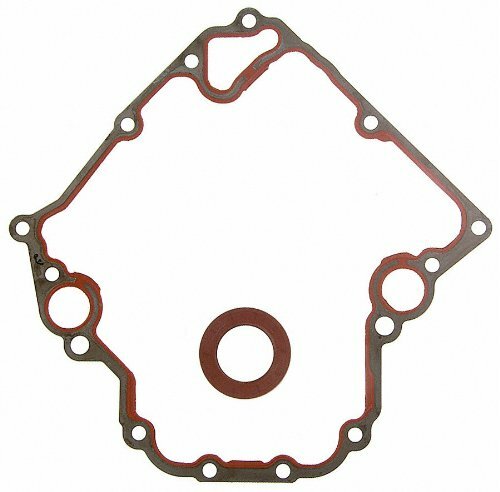 CODE "B18B1" 1997-1998 HONDA CR-V EX LX 2.0L 1997CC L4 DOHC, (16 VALVE), ENG. CODE "B20B4" 1999-2001 HONDA CR-V EX LX SE 2.0L 1997CC L4 DOHC, (16 VALVE), ENG. 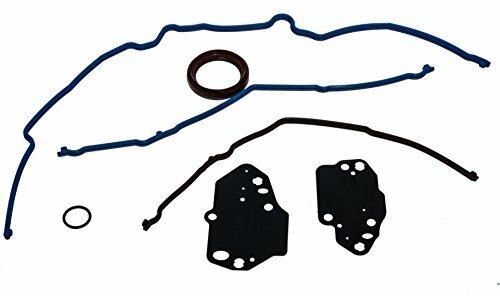 CODE "B20Z2"
3-Valve Timing Chain Kit Cam Phaser & VVT Valves Water Pump Timing Cover Gaskets With Tensioner (Left & Right Upper) For 2004-2011 Ford Expedition F-150 F-250 F-350 2005-2010 Lincoln Navigator Mark 5. "▶Description: -- 100% Brand New,never been used -- Perfect match for the original car.Easy installation -- Stable characteristics, high reliability -- No installation guide is included -- Professional installation is highly recommended ▶Fitment: -- 04 - 08 FORD / LINCOLN 5.4L SOHC V8 (24-Valve), 3-Valve Engine ONLY, TRITON -- 05 - 11 FORD EXPEDITION 5.4L 330CU. IN. V8 SOHC (24-Valve) -- 04 - 09 FORD F-150 5.4L 330CU. IN. V8 SOHC (24-Valve) -- 05 - 10 FORD F-250 SUPER DUTY 5.4L 330CU. IN. V8 SOHC (24-Valve) -- 05 - 09 FORD F-350 SUPER DUTY 5.4L 330CU. IN. V8 SOHC (24-Valve) -- 07 - 07 LINCOLN MARK LT 5.4L 330CU. IN. V8 SOHC (24-Valve) -- 05 - 10 LINCOLN NAVIGATOR 5.4L 330CU. IN. V8 SOHC (24-Valve) -- Will FIT 5.4L V8 3-Valve Engine ONLY. 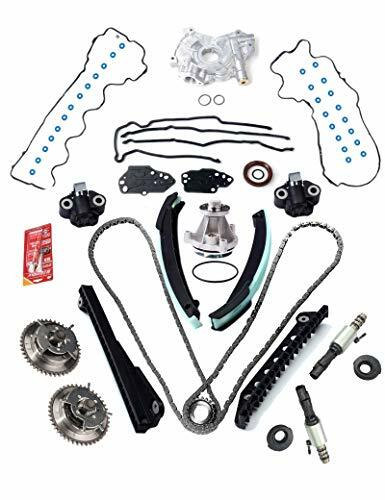 ▶Package includes: 2 X Timing Chains (122 Links/C-391) 2 X Camshaft Phaser Sprockets 2 X Cam Phaser Sprocket Mounting Bolts 1 X Tensioner (Left Upper) 1 X Tensioner (Right Upper) 1 X Guide (Tensioner Rail-Left) 1 X Guide (Tensioner Rail-Right) 1 X Guide (Fixed Rail-Left) 1 X Guide (Fixed Rail-Right) 1 X Crank Gear (Double Row-One Side Recessed Only) 2 X Camshaft Spacers 2 X Vct Variable Camshaft Timing Solenoid Oil Control Valve (Left & Right) 2 X Screws 2 X Oil Control Valve Seals 1 X Timing Cover Seal Set 1 X Timing Cover Gaskets"
Compare prices on Timing Cover Gasket Kit at LiveSaler.com – use promo codes and coupons for best offers and deals. We work hard to get you amazing deals and collect all avail hot offers online and represent it in one place for the customers. Now our visitors can leverage benefits of big brands and heavy discounts available for that day and for famous brands. We try to makes comparison shopping easy with Product Reviews, Merchant Ratings, Deal Alerts & Coupons. Find Deals, Compare Prices, Read Reviews & Save Money.